Make your afternoon tea an iced one with a cold brew tea gift set. 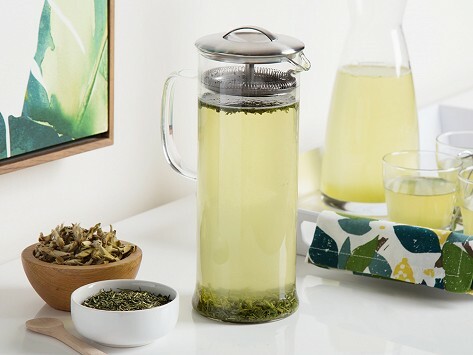 Cold brewing is a slow and gentle way to infuse tea that creates more intense flavors and aromas. This set has everything you need to brew your own at home, including organic and orthodox loose leaf teas. This means the tea is hand-picked and processed according to traditional practices and it is all sourced from small-scale, non-industrial tea farms. Brewing is easy—just steep the tea overnight in the container, strain, and enjoy. Dimensions: 11.8" x 5.1" x 5.1"